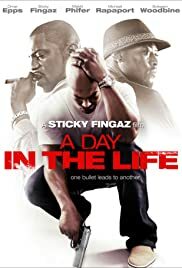 Bad blood between two urban crime families explodes into an all-out turf war in this gritty, hard-hitting drama set to rap and starring music legend Sticky Fingaz. First of all, I was amazed at the cast that he put together for this film. Even actors that aren't household names that you might recognize appear in this movie. You almost forget that it is an indie with this amazing cast. The plot is your typical drug war trying-to-get-out-the-game story but the fact that everyone raps for 120 minutes makes it interesting enough. There are only several other movies that did this but not as great as this one(i've seen them all). Not to mention this was written by sticky fingaz, maybe not alone but definitely written by him. On the other hand, sticky was also the director. Some of the camera angles and scenes left you saying "wtf?" and wondering if they had enough time to edit the film before release. I laughed when I seen the credits- stick had his hands in every thing but most noticeable was that he was a camera man. Unlike some of the other movies onyx played in, this one had no problems at all with acting and could have been a great film if it weren't for the terrible camera work. All in all, I definitely suggest you rent/buy because it is something different. You might get some laughs in, I know I did.